The sprawling Hermitage Museum has long reigned as the world's largest museum—but China has plans to come close to it with a huge new building for the National Art Museum of China, the design plans for which were recently released by French architect Jean Nouvel. The 1,399,308-square-foot building is destined for a site on the complex where Beijing last hosted the 2008 Olympics, according to The Art Newspaper, and will house thousands of years' worth of Chinese art. 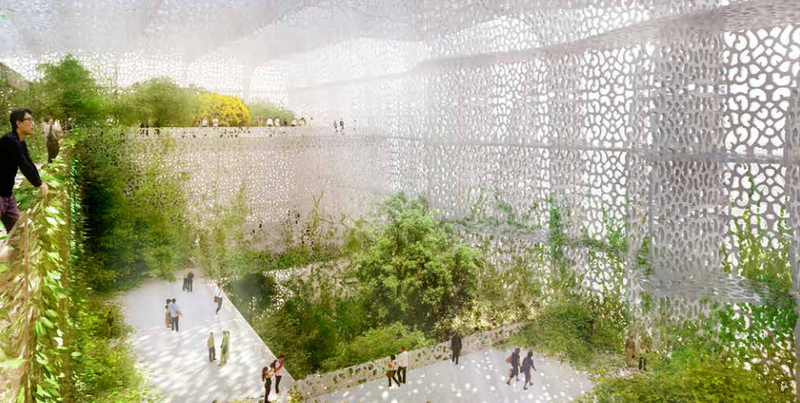 Nouvel has designed some of the most interesting cultural buildings and museums on the planet—see his fantastically beautiful Institut du Monde Arabe in Paris—and it looks as though he's gearing up to do the same for China's national collection. The renderings show a delicate, lace-like lattice drawn fro classical Chinese patterns, formed to a rough cube that encases the warren of interior spaces. At the beginning of the XXI st century museums are still too often considered as places for conservation, consultation and education. The NAMOC represents an incredible opportunity for the most ambitious materialization of a place for expression, of communication and attraction, a place that witnesses the vitality of a civilization, the civilization of the greatest people on earth. So if not education or conservation, then what? Our goal is to protect the miracles created with ink throughout the centuries, to reveal the force of a living art… to welcome the artist of tomorrow.